In today’s fast paced world where instantaneous is the new norm and the word “slow” is anathema in our society, it is comforting to see that some forms of art have not taken on this trait. Therefore, it is with the exhibit “Origamic Architecture” that I stumbled upon at the Japan Foundation. If one has not been to this centre in the Colonnade Building on Bloor St. I highly encourage you to visit. It is a calm and comforting oasis in the city, highly in keeping with the Japanese aesthetic. On display in this show were card stock that had been carefully and meticulously crafted into stunningly complex models of buildings, monuments, temples and abstract forms. These three-dimensional forms are akin to pop-up models that one usually associates with children’s books. 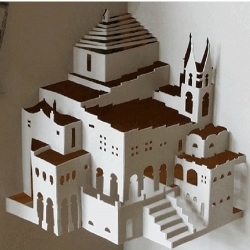 However, these creations are constructed out of a single sheet of paper, whereas pop-ups utilize several. High art this may not be, but any type of creativity that speaks to oneself regardless of the medium or the degree of acceptability or cache it holds within the art world, should be enough to warrant investigation. Some may call this work “crafty” and not art at all, however art is subjective to the viewer and I believe that one should be open to all types of inspiration. The models on display were carefully cut with a technical knife, folded and required due patience, skill and mechanical expertise. The results are dramatic, minimalist, monotone zen like renderings of the implied form complete with openings for doors and windows, dramatic rooflines and decorative accoutrements. To say the skill of an architect is needed may not be far from the truth. This is definitely a slow and laborious method of creating an object, however the result is one of understated beauty that engages the viewer to contemplate not only the positive but negative spatial occurrences. 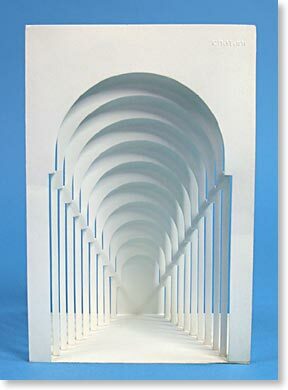 The late Masahiro Chatani (1934-2008) an architect by trade and the founder of Origamic Architecture designed each piece. He was passionate about this type of work and traveled extensively teaching and exhibiting his talent along the way. To re-iterate it was soothing to view such creativity contrived with slow, deliberate and painstaking beauty.